You see how it works, just like a vending machine. Sure it’s only working a few weeks a year, but nature doesn’t work on our timetable. She does it when ever she bloody well wants! D: You have more than one fruit vending machine running at the same time, which means you need to start all over at step one – you poor thing!! Now how it works good is if you get yourself a whole heap of fruit tree vending machines, and chances are at least one of them will be ‘working’ at any one time. You get it! 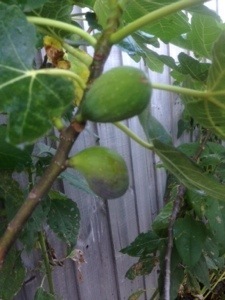 Tags: Fig, garden, gardening. Bookmark the permalink. I love fig. It is amazing to get up and go to the end of your garden and pick a figs. As you say, if you don’t eat them when they are ripe you will only see the skin left next time. Birds are brilliant at knowing which one is ripe. Nice blog with plenty useful tips. Thanks. Why thank you for writing TC. 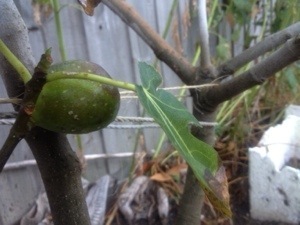 Figs are a glorious tree to grow in the garden, but yes those bloody birds know exactly when to get which fruit, and somehow only JUST before I get to them! I have planted out “fruit tree alley” with a couple of small trees which will be espalliered, and a passionfruit vine on the fence, along with strawberry pots. It sure will be nice when my vending machine starts producing. Wow that sounds amazing. Have you done espalier trees before or is this the first time? Definitely something that I’d like to try more of in future.